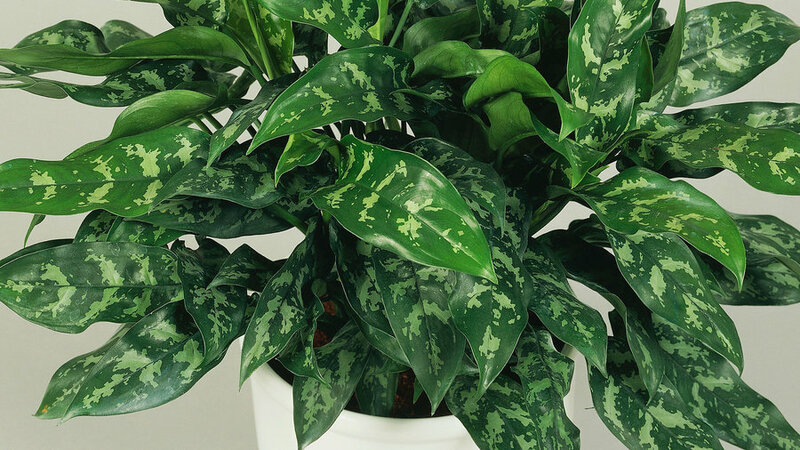 Both its toughness and handsome foliage account for Aglaonema’s popularity. Its graceful, oblong leaves grow from a central stem; depending on the type, leaves may be solid medium green or splotched with various shades of gray and green. True to its tropical origin, Aglaonema prefers good light and high humidity, but performs admirably well even when both are low. Growing conditions: Aglaonema likes a standard potting soil, warm temps, bright, reflected light, and frequent waterings. Except in winter, apply a complete fertilizer regularly. Aglaonema will tolerate potbound conditions for long periods. Offering generous size, fascinating foliage, and good tolerance of indoor conditions, Dieffenbachia is a fan favorite. Leaves are variegated in greens and cream colors. Young plants generally grow on single stems, but older plants may develop multiple stems. Flowers that look like odd, narrow calla lilies form on mature plants. Acrid sap from the leaves, if eaten, burns the mouth and throat and may actually paralyze the vocal cords. 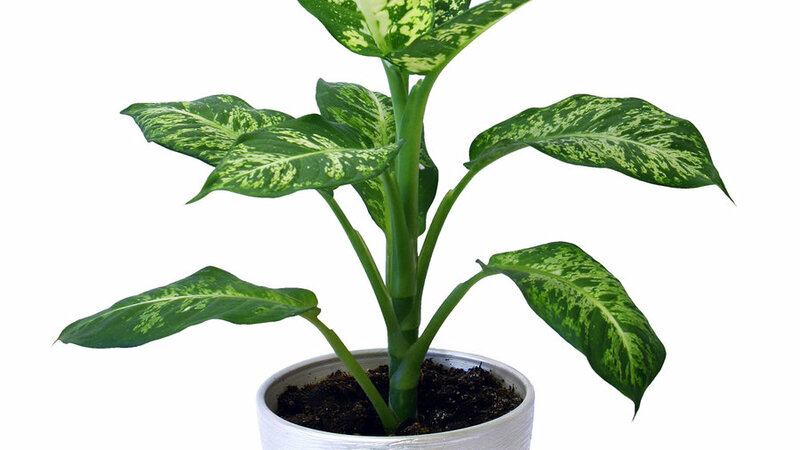 Growing conditions: Dieffenbachia likes filtered light or a northern exposure. It’s happy with standard potting soil, average home temps, and average humidity. Water it when soil feels dry to the touch. Except in autumn and winter, apply a complete fertilizer regularly. Turn plants occasionally for even growth. Dieffenbachia will not survive constant overwatering. And sudden changes from low to high light levels usually inflict sunburn on leaves. If the plant becomes leggy, cut it back to 6 inches from the soil line. Clean leaves regularly with a damp cloth. 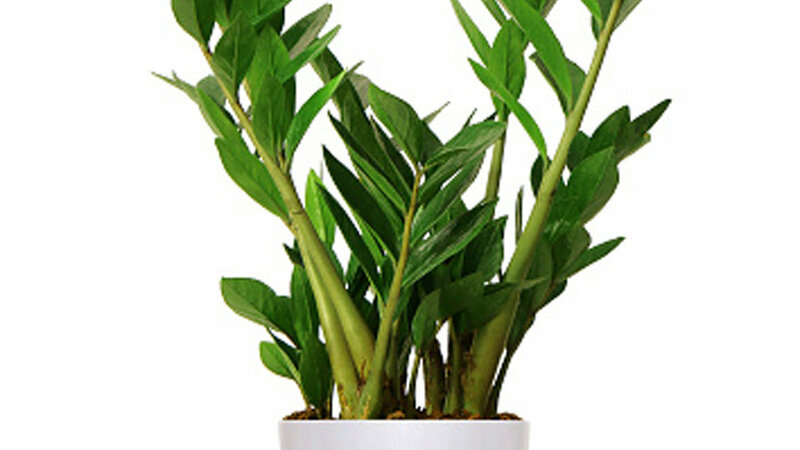 Growing conditions: Zamioculcas thrives in standard indoor potting soil. Let the soil dry out slightly between waterings. Place Zamioculcas where it will receive bright filtered or reflected light. Avoid direct sunlight as it can scorch leaves. It’s happy in average home temperatures. Growing conditions: Chlorophytum prefers bright, reflected light, standard potting soil, and average house temps. Though it will tolerate the low humidity of most homes, it does benefit from frequent mistings. Let the soil dry out a bit between waterings. 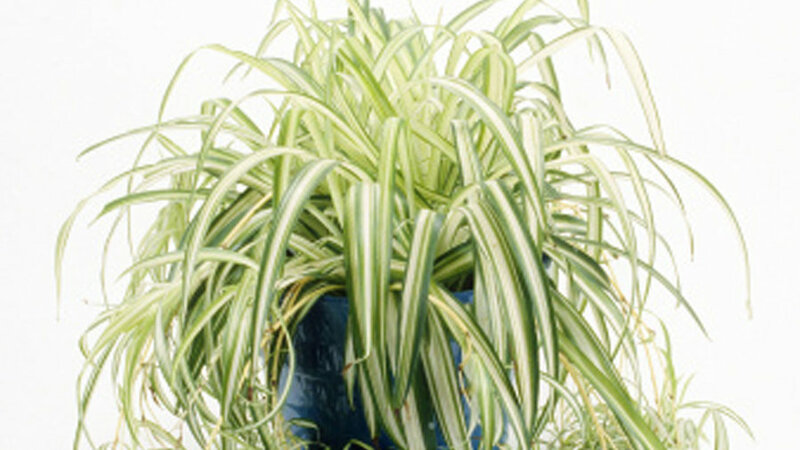 If you grow Chlorophytum in a hanging basket, rotate the basket a half-turn every week or so to produce even, well-spaced growth. Small plants at the ends of stems grow complete with roots, so you can snip them off and plant them. 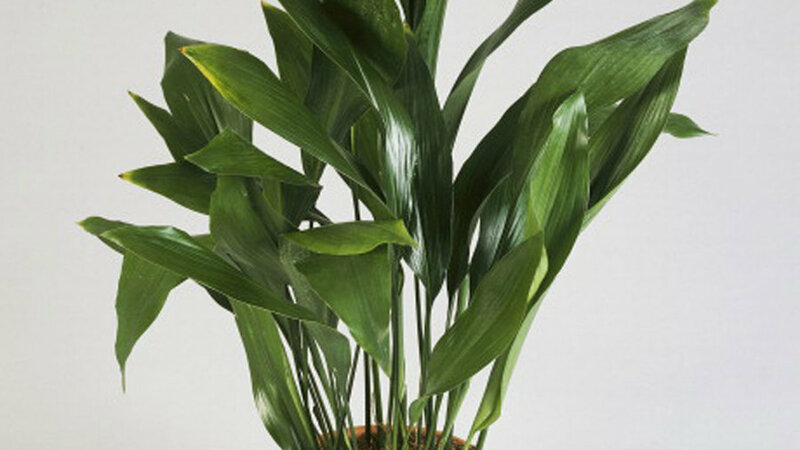 Growth conditions: Though very tolerant of a wide range of conditions, Aspidistra prefers high humidity, cool temps, and a standard, porous potting soil. It’s one of the best choices for low-light locations, but keep it away from direct sunlight. Keep it evenly moist; except in autumn and winter, apply a complete fertilizer regularly. Allow it dry out somewhat during the autumn and winter rest period. Large, smooth leaves attract dust in a hurry—keep them clean with a soft, damp cloth. Don’t use commercial leaf shine products. Brown or burned tips usually result from too much water or fertilizer, particularly during autumn and winter. This plant is remarkably free of pests and diseases, and is quite long-lived. This feathery-leafed palm is amongst the easiest palms to grow indoors. It tolerates crowded roots and low light. 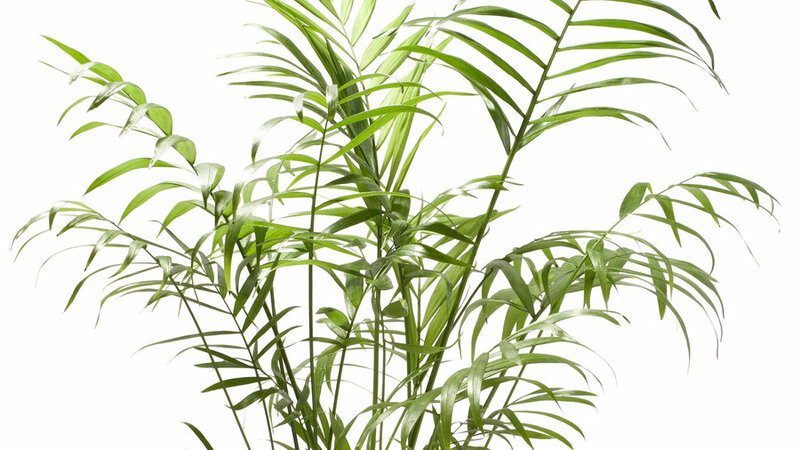 A single-stemmed palm, it’s a favorite for close planting in clumps of three or more. Eventually these will reach a height of 3 to 4 feet. Repot Chamaedorea elegans every 2 or 3 years, using a slightly larger container and fresh potting soil; be careful because roots are brittle. Growing conditions: Choose standard potting soil. During spring and summer months, when most palms are actively growing, they need regular water—enough to keep their soil consistently moist but not soggy. During the cool winter moths, allow the top inch or so of soil to dry between watering. Palm root rot quickly if kept damp for too long. Except in late autumn and winter, apply a complete fertilizer regularly. Growing conditions: Dracaena prefers bright, indirect light; it tolerates dimmer light, but growth slows as a result. The plant grows well with standard indoor potting soil and average house temps and humidity. Keep soil moist (like a squeezed-out sponge) but not soggy; fertilize regularly during spring and summer with a complete fertilizer. During autumn and winter, water less frequently and stop fertilizing. To keep Dracaena in good health and looking its best, regularly wipe leaves off with a damp cloth or move your plant to a location where it can be given a gentle shower. Avoid commercial leaf shine product. If your plant develops brown tips, simply cut them off with a pair of scissors, making sure the trimmed leaves still have a natural shape. 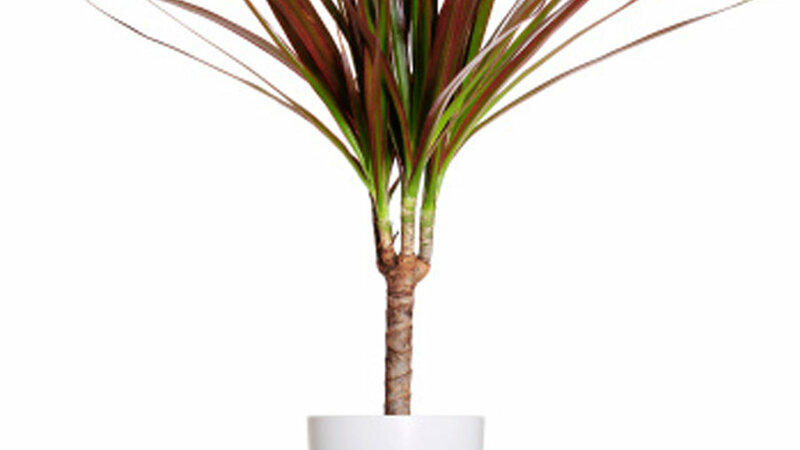 Dracaena will tolerate a pot-bound condition for long periods and is rarely bothered by pests or diseases. Growing conditions: Ficus elastica tolerates less light than most other plants of its size, but is happiest in bright, reflected light. It needs average room temps. Except in autumn and winter, apply a complete fertilizer regularly. Provide a standard indoor potting soil, keeping it moist (like a squeezed-out sponge), but not soggy. Mist during warm months, and in winter if the indoor air is warm and dry. In winter, let the soil dry out slightly between waterings; overwatering (or allowing water to collect in a saucer or cachepot) commonly leads to leaf drop. (Unwitting owners may increase water, thinking loss of leaves is a symptom of drought.) 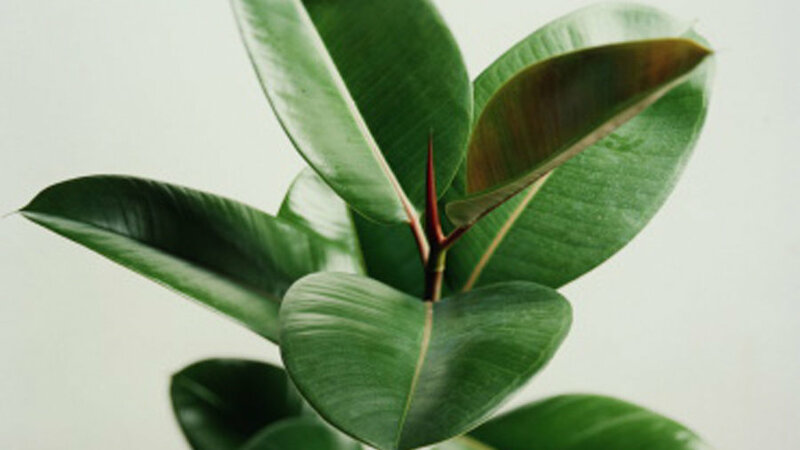 Ficus elastica is generally pest-free. 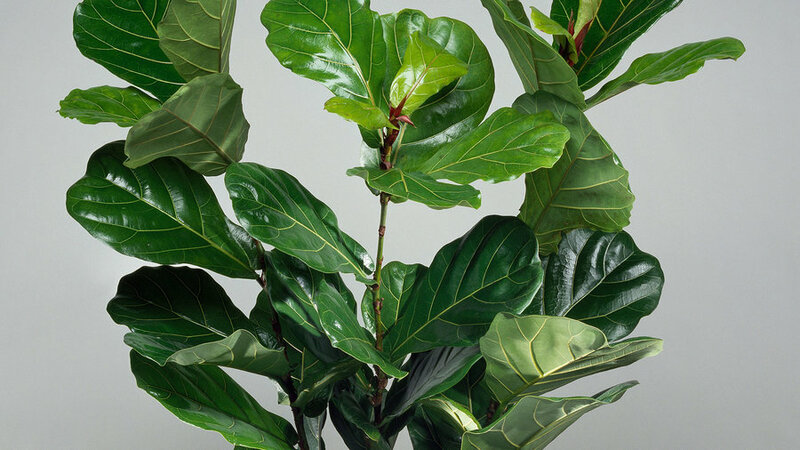 Ficus lyrata has huge dark green, fiddle-shaped leaves. Prominently veined and glossy, the leaves grow to 15 inches long and 10 inches wide. Prune the top to make the plant bushy. Growing conditions: Ficus lyrata needs average room temps. Except in autumn and winter, apply a complete fertilizer regularly. Provide a standard indoor potting soil, keeping it moist (like a squeezed-out sponge), but not soggy. Mist during warm months, and in winter if the indoor air is warm and dry. In winter, let the soil dry out slightly between waterings; overwatering (or allowing water to collect in a saucer or cachepot) commonly leads to leaf drop. (Unwitting owners may increase water, thinking loss of leaves is a symptom of drought.) Ficus lyrata tolerates low light; it doesn’t require a large pot, but be sure to stabilize a large plant in a small pot so it won’t tip over. For health and best appearance, keep the leaves clean—wipe them with a damp cloth or give your plant an outdoor shower. 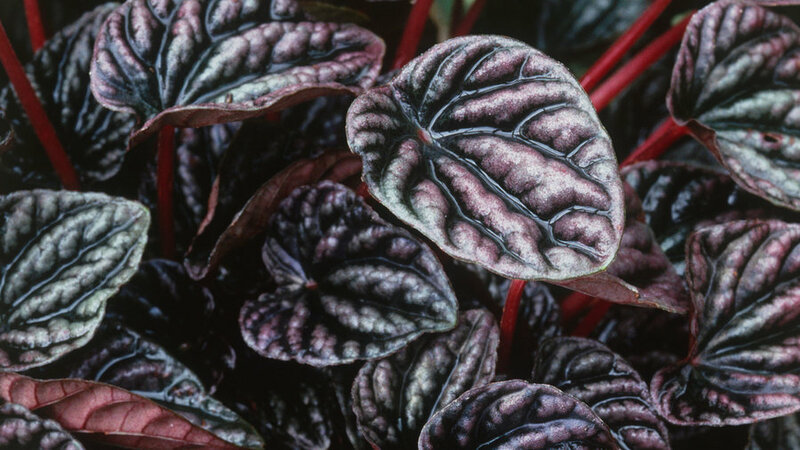 The low-growing, compact foliage of Peperomia offers a ton of diversity of leaf shape and color. Foliage is its prime attraction, but Peperomia usually produces tiny flowers as well, in dense, small, slender spikes. Growing conditions: Peperomia needs protection from direct sun; it appreciates a window with northern exposure, or any window with filtered light. It prefers temps in the sixties, but will also happily tolerate warmer conditions. Plants need misting occasionally in spring and summer, but not during the cooler winter month. Use a standard indoor potting soil and keep it moist but not soggy. During winter, allow the top inch of soil to dry out between waterings. Except in autumn and winter, apply a liquid fertilizer diluted to half strength once a month.